The Darlingtonia Trail in the Smith River National Recreation Area of Six Rivers National Forest is on the north side of Highway 199. You’ve likely seen the sign for “Botanical Trail” when traveling Highway 199 to and from Jedediah Smith Redwoods State Park and the California coast near Crescent City. Darlingtonia californicus (California pitcher plant) flourishes in serpentine geological settings in Six Rivers National Forest. The short trail is well worth exploring (and it’s wheelchair accessible). You get a chance to stretch your legs, but more importantly, the 0.2 mile flat and easy trail has several interpretive panels that explain the nature of the serpentine geology that’s so common in Smith River National Recreation Area. 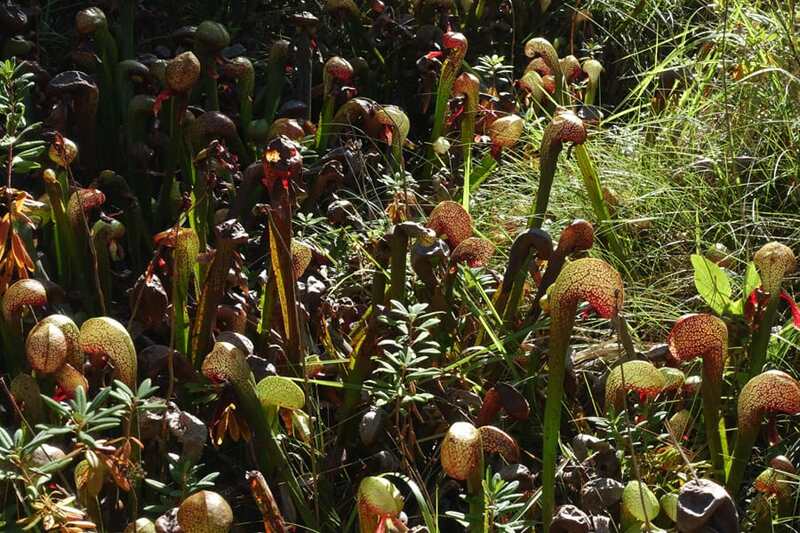 You’ll learn how this serpentine geology affects plant life and explains the presence of Darlingtonia californica, also known as California pitcher plant and cobra lily. The trailhead is on the north side of US Highway 101. Look for the sign 17.9 miles northeast of the junction of US Highway 101 with US Highway 101, 3.5 miles east of the Smith River National Recreation Area Visitor Center on the east side of Gasquet. If you’re coming from the north, it’s 15.6 miles southwest of the the south end of the Collier Tunnel and 1.1 miles west of Grassy Flat Campground. 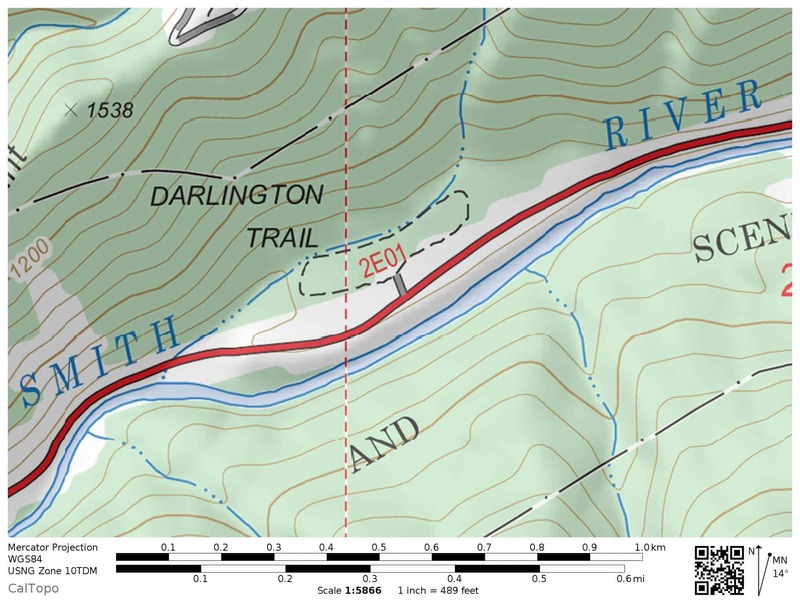 The Darlingtonia Trail (2E01) is a 0.2 mile loop. Doing it clockwise will quickly bring you to the interpretive panels and the two platforms that give you up-close views of the Darlingtonia bogs. Make sure you stay on the trail and do not pick or touch any of the cobra lilies. This spot (along with much of the Smith River National Recreation Area) has serpentine soils. Serpentine rocks degrade over time into serpentine soils, which have especially high concentrations of cobalt, chromium, and nickel, and especially low concentrations of calcium and potassium. This combination is toxic to many plant species, while other species survive in more stunted forms, and some have evolved to thrive in serpentine conditions. 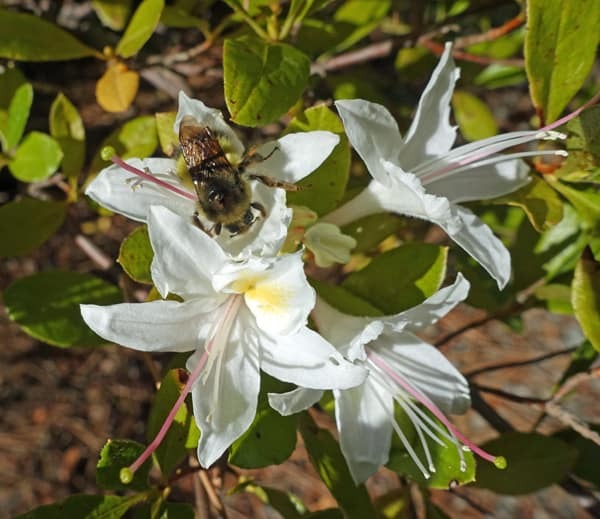 Western azalea with bee, Darlingtonia Botanical Trail. Look for these common tree and shrub species: Douglas fir, incense cedar, Port Orford cedar, sugar pine, Jeffrey pine, canyon live oak, tanoak, madrone, California laurel (myrtle, California bay), huckleberry, coffeeberry, Labrador tea, western azalea, manzanita, blue-blossom ceanothus. You’ll also see a variety of wildflowers, including lupine and trillium. Three names for the same plant! Relatively uncommon, it grows in bogs and seeps on a variety of soils, including serpentine soils, in Northern California and western Oregon. “Cobra lily” comes from the resemblance of the “head” of the plant to a cobra. Darlingtonia californica is also a carniverous plant: it traps insects and then secretes enzymes to digest them. 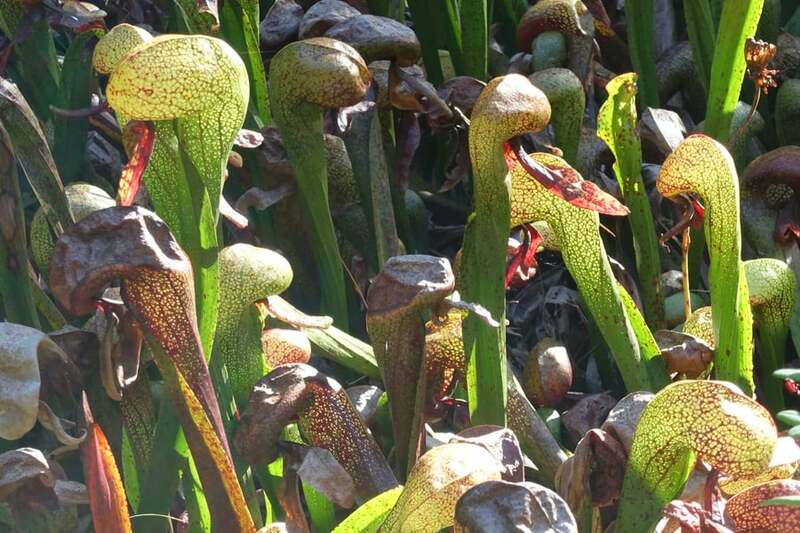 The Darlingtonia Botanical Trail features Darlingtonia californica (cobra lily). There’s another trail nearby that leaves from US Highway 199: the French Hill Trail across the road from the Smith River National Recreation Area Visitor Center. In contrast to the Darlingtonia Trail, it climbs for nearly all of its 2.8-mile length to French Hill Road. See my French Hill Trail blog post for a detailed discussion, including a map and photos. Have you done it? What did you think?